Over dotty smock top, originally uploaded by indiaeden. 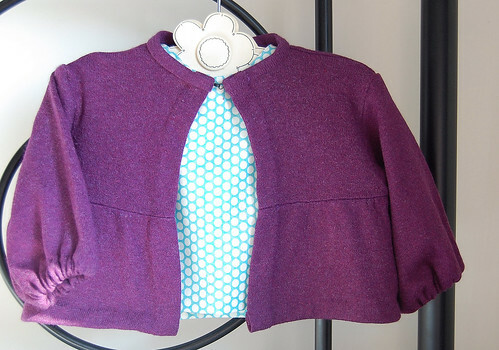 I made this little cardigan from a cardigan of my own that I accidentally spoiled with paint. It's a nice soft, well worn in cashmere mix, so I decided to recycle it for baby boy. I used my smock pattern pieces for the bodice and the sleeves, and bound the neck edge with the left over neck edge from the original cardy. I also made casings at the sleeve edge for elastic, and used a hook and eye for closure. Only the shoulder and side seams were sewn by machine, everything else was sewn by hand, which I think looks better, and was actually very therapeutic. This week has been rough emotionally, starting with my birthday, and ending with the sad news of baby Freddie. I've been crying in public again, and the flashbacks are more frequent. Yesterday it was warm, I risked removing my coat on the school run, but held it protectively over my bump. I was walking with a good friend, but then saw heading towards me a lady I just did not want to talk to. She's a nice person, but just, well, just a little odd, and tactless. My friend also spotted her, and I think our sudden "deep conversation", plus my expert "FO vibes" headed her off...phew! the cardi is fab as is the whole outfit. big hugs for the rough week. You must have the best dressed kids in town. Sorry you've had a rough week. I felt like they were all rough weeks when I was preg with Angus. 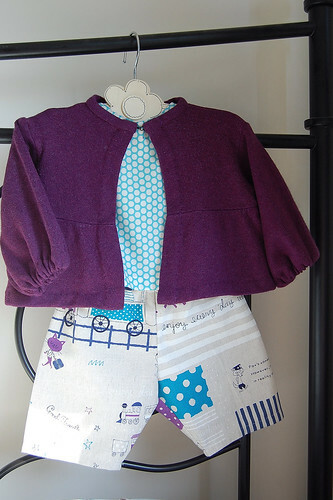 That cardy is scrummy - I love purple! Oh, lovely! I love dressing my little boys in purple too.